From Route 66 to the University of Tulsa, show off your Tulsey Town event with the Tulsa Poster. 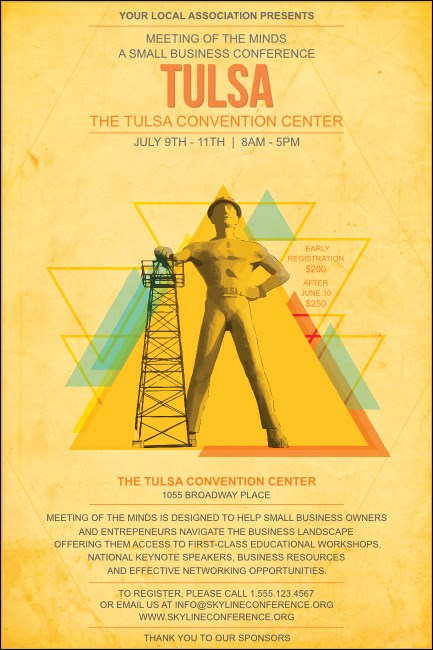 Create beautiful publicity for your event with this uniquely Tulsa design, featuring gorgeous yellow, blue, and orange tones with the Golden Driller standing strong. For whatever event you host in the arts and culture center of OK, we have the right poster for you! Need tickets? Wristbands? Fliers? Choose a Matching Event Kit from TicketPrinting.com.